Knives are one of the oldest tools used today. It is a portable and easy-to-carry device that offers a wide range of usage all around the world. Knives are being used since decades though they have evolved to become better with enormous efforts of the manufacturers by the passing years. Mora knives are one of the popular and sharpest knives that the market has to offer. This article offers all that you need to know to help you pick the best Mora knife for yourself. 1 What Are Mora Knives? 4 How Are The Lines Of Mora Knives Determined? Mora knives are knives are small in size, having fixed sharp blades that may or may not possess finger guards. People residing in Finland as well as Sweden are known to use Mora knives enormously in the industries as working tools and for construction as well making them economically useful. These are one of the sharpest and most loved products in its field. 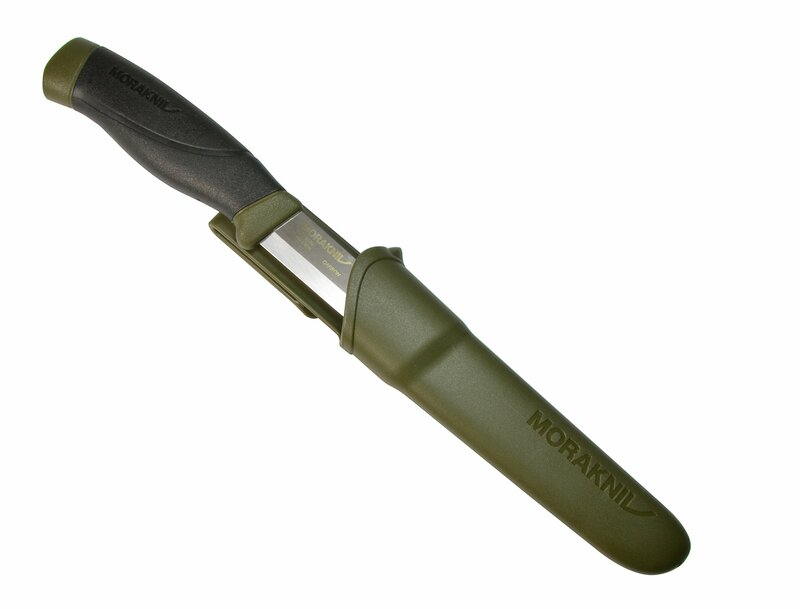 The Scandinavian armies are also known to use these Mora knives for their daily usage. Knives whether Mora or any other seem almost similar when looked at. But once you start comparing them you start differentiating precisely. These differences get more accurate when you start to hold and use them. You will be thorough with the differences in the blades, handles, and sharpness of the knife. Therefore, it is very important to well understand the product before you make a purchase. With the passing years, Mora has produced a wide range and line of products with varying names of the models like Companion, 711, HighQ etc. The birch handle classic Mora knife has been manufactured and used for decades. It came in different varieties and was named as 1, 2, 3, etc. Later, the Mora designed knives started being manufactured with handles made up of polymers and rubber and these were named with numbers like 711, 840, etc. Following which, more descriptive names started coming up like Craftline and Allround. How Are The Lines Of Mora Knives Determined? Many of us stay in the perception that the knife lines are determined by the different kinds of blades used. It isn’t wrong to say that different knife lines have different kinds of blades but the fact is that a product line completely depends on the style of the handles. Some newly manufactured blades are thin and sharper at the edges. These Mora blades are specially designed for the dual purpose of cutting and slicing perfectly from the thinner end while offering heavy cutting from the other remaining end. Although the blades look the same and do similar kinds of work but to precisely pick the best to suit your purpose can be only done by using the knife. Mora Outdoor 2000 Handle– This is an amazing product with a brilliant design and offers firm a grip. 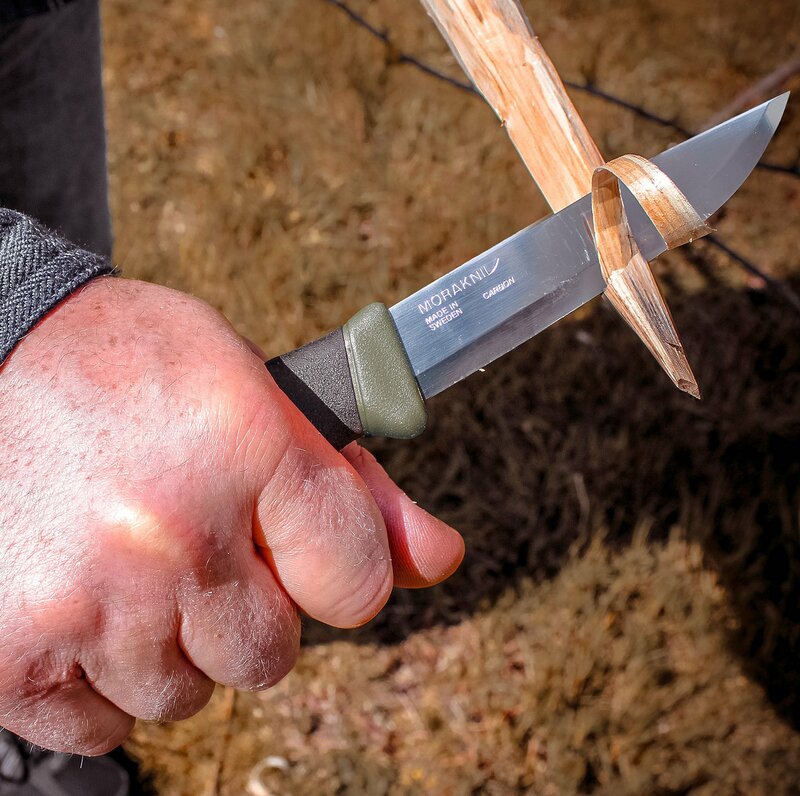 Mora Bushcraft Handle– Made up of the famous TPE rubber which keeps it friction-free and impact-free. It is slightly curved and offers grooves for the fingers to give the user a comfortable grip. Mora Companion Handle– These handles are one of the old designs made up of the TPE rubber which makes it resistant to friction. It is slightly curved but offers a great and firm grip. 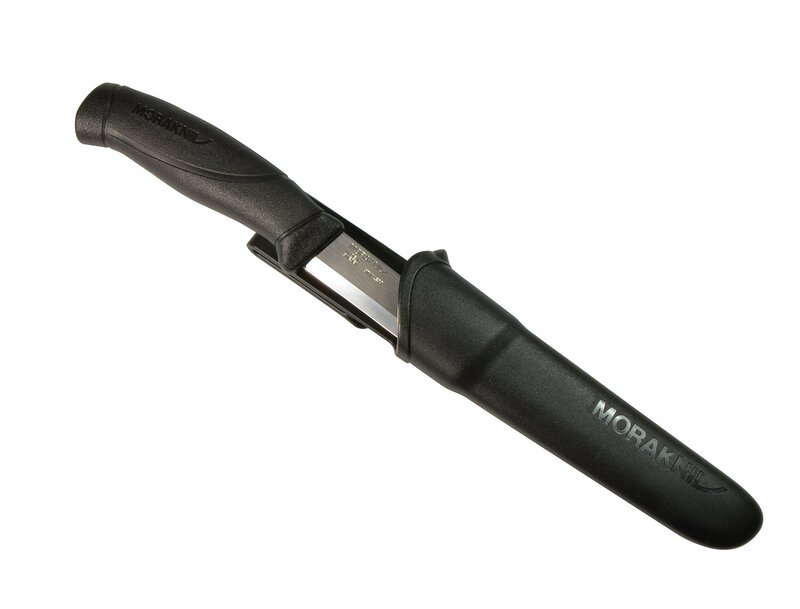 Mora Pro Handle– It is made up of TPE rubber which makes it friction resistant and strong. It is a straight handle with a well-defined swelling at the center as well as a finger guard. Mora Basic Handle– It is very much like the Mora pro handle but it is made up of a very tough and strong polymer instead. This handle lacks the finger projections. These are extremely strong and are used for rough usage. Mora Classic Handle– It is a wooden handle with the birch painted in red with a swelled up palm portion. The Morakniv Companion is a multi-purpose knife perfect for the outdoor users with a very comfortable, firm, friction resistant grip. It consists of a blade of 4.1″ made up of hard carbon steel. Carbon steels are highly durable and can be sharpened whenever needed. These knives perform extremely well while cutting and chopping woods. If you use the knife in a wet environment make sure to dry it well post use to avoid unnecessary corrosion. A sheath made up of green color with a flip covers and protects the knife. A sharp carbon steel 4.1-inch blade that imparts high durability to the knife and you can even sharpen it time and again according to your will. With an overall length of 8.6 inches and a protective sheath, it becomes very easy to be carried to different places. This Mora knife is a perfect pick for the ones looking to chop and gather tiny tinder for a fire. It is an amazing product to carry when you are out and require chopping and carving loads of stuff like wooden branches. The color of the knife leads to fade with time. You have to be very careful to clean it each time post use as it might corrode if frequently put in contact with water. The Morakniv Companion is an excellent tool with a sharp blade of 4.1 inches made of stainless steel which makes it perfect to chop and carve little tender branches to prepare a fire. It enables wood cutting and carving activities and even minute slicing can be easily performed by it. It is a perfect tool for you if you go out for camps or outdoor activities very often. This easy to carry tool will please you with its performance each time u use it. A protective sheath with matching color along with a clip in the form of a belt to accommodate the knife. A sharp blade of 4.1 inches made up of stainless steel (Sandvik 12C27) makes it a very hard and dependable product. A patterned and easy to hold firm, friction free grip that performs brilliantly in all the climatic conditions. Extremely hard, sharp and tough knife with an excellent edge performance. It is necessary to clean the knife and its blade on a regular basis to keep it rust free. Morakniv Companion Heavy Duty is an amazing product to carry if you are an outdoor dweller and involve in camps and hunting often. It comprises of a thick, sharp blade made up of carbon steel which has a much sharper edge. The handle is made up of friction resistant rubber that makes it an easy to hold and use the product. Since the blade is composed of carbon steel it can be easily sharpened again as and when required. Carbon steel provides high durability to the product. Has a plastic made protective sheath with a belt clip. A sharp blade with an even sharper edge makes it perfect for various purposes like wood cutting, carving branches, batoning and chopping tiny branches. A huge handle made up of friction resistant rubber to offer a firm grip that makes it easily handled. The blade is made up of stainless steel and can be re-sharpened according to the needs of the user. Highly durable with a sharp edge which makes it easier for it to pierce through hard coverings. Regular cleaning is required such that the blade stays rust and corrosion free. If you use it to cut fruits and do not clean it you might find black spots all over the blade. Mora knives are one of the best outdoor knives that the market has to offer. Its varying sizes and thickness of the blades offer the user a wide range to select the perfect one for their use. These knives are well known for their commendable performances in especially the outdoor activities. Cutting and chopping of slim wooden branches and collecting timber for fire is an easy task for a person having a Mora knife grip. The handles, on the other hand, are generally made up of thick and friction free polymer or rubber that makes it easy and comfortable to handle and use. The best Mora knives mentioned above are solely based on customer reviews and you can easily pick one as per your needs.